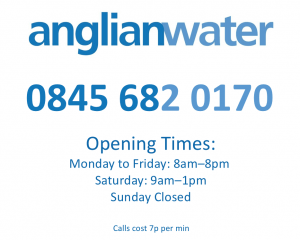 Contact Anglian Water on this number about customer service enquires or enquiries, billings, complaints, emergency leaks or meter readings. Calls to Anglian Water (in the UK) to 0845 prefixed phone numbers cost 7p/min service charge, plus your phone company’s access charge (set by them), and are not compatible with free inclusive minutes allowances. Alternatively you can call their local rate, mobile friendly numbers below. They will be able to help you with any issue you have, and put you in contact with the right departments to resolve your issue. This billing service team will be able to help you with any issues you have with reading your meter, overpaying on your bill or setting up a new payment method. You can also contact Anglian Water on this contact number to resolve any account enquires. 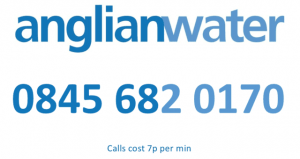 To pay your Anglian Water bill over the phone you can use their automated billing contact number: 03450 268 926 This line is open 24 hours a day 7 days a week. If you know of a leak, don’t wait. Call now. This number can be used for water supply or wastewater emergencies, blocked drains or possible pollution. The ‘report a leak’ contact number is open 24 hours a day, 7 days a week, so don’t hesitate to get in touch. If you have a query or want some advice, we’re here to help. Here’s how to get in touch. We offer a 24-hour text telephone service for customers with speech or profound hearing difficulties. If you have a Minicom unit we can talk to you through a special keyboard. Double-check any Anglian Water employee’s identity. Please call us for more information about having a meter installed. If you’re planning a new development or extending your home and have a query about a new water or drainage application, please give us a call.